There was a windmill outside the Barre Gates by 1328. Barre Gate was also known as Pockthorpe Gate. 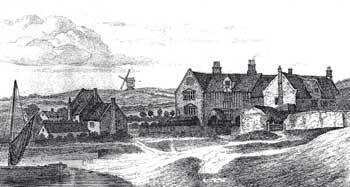 The mill was known by some as Hassett's Mill and stood near the centre of modern Lavengro Road circle. This sunk post mill was marked on the 1558, 1611, 1696 and 1723 maps. On the 1696 map it is marked Pockthorpe or Hassets Mill. A map of 1718 appears to place the site of the mill roughly where the later Pockthorpe smock and tower mills stood, or it may indicate a post mill stood before the smock mill. The 1723 map shows it as an open trestle sunk post mill. The site is about 100' above sea level. 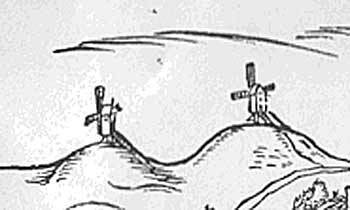 A WINDMILL near Pockthorpe Gates, with one Pair of French Stones, with a Lease of five Acres of Land whereon the Mill Stands. Fourteen Years unexpired of the said Lease. For further Particulars enquire of Mr. William Humphry at the New Mills. CASUALTY, On Thursday, as Jeremiah Marshall, of Pockthorpe, was assisting in getting a large mill-stone upon a drug, it ran back and fell upon his thigh, the bone of which it crushed in so shocking a manner that he was obliged to be immediately carried to the Norfolk and Norwich Hospital; and from the very humane and liberal attention which is always paid to distressed object by that very benevolent institution, there are great hopes of his doing well. The mill was destroyed in 1787. 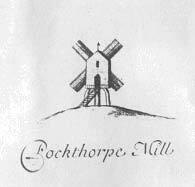 The rebuilt Pockthorpe mill only lasted eight years before being burnt down on Thursday 16th April 1795. On Thursday night last, about twelve o'clock, a windmill on Mousehold, near the Barracks, was perceived to be on fire - very soon the whole was in flames and totally destroyed before the least assistance could be given. The effect of the light upon the surrounding objects, and the stillness of the night, rendered the scene awfully grand. A mill in the same place was destroyed about 8 years ago, and we are sorry to hear this was not insured. Although the mill was marked on maps of 1797 and 1826 there is no other evidence that the mill was rebuilt after the fire of 1795. The 1797 map was surveyed between 1790 and 1794 and thus would have shown the earlier mill. The 1826 map could have simply copied the 1797 map and marked the mill, a common practice at the time. It was not marked on the 1830 map. -1328+ -1558 to 1787, 1787 to 1795, 1795 to 1826+?